Of the many foods Northeast Wisconsin is known for – none is as recognizable as the bratwurst. The best – and in the opinion of many – the only way to eat them is grilled and soaked in beer and onions. Travel outside of Wisconsin and you’ll soon realize that not everyone really knows how to make a Green Bay-style bratwurst. While it was a valiant attempt, it didn’t even come close the kind we grill up around here. Maybe it was because my Alma matter, Oral Roberts University, is a dry campus – which would make beer for the brats hard to come by. But the truth is – nobody knows how to make beer brats on the grill like real Wisconsinites. To Par-Boil or Not to Par-Boil? At some point, your sausages need to soak in a mixture of beer and other ingredients (more on that later). But the big question is whether you put them in the beer before they go on the grill or after. A lot of people will tell you to par-boil the bratwurst in beer and onion and then brown them up for a short time on your grill. There’s nothing wrong with that school of thought – but I like to do it the other way around. Put your brats on the grill and briefly brown them on both sides. Don’t cook them all the way through. Let them finish cooking in your beer mixture. The benefit of this is that even if you burn your brats by mistake – they still tend to plump up again in the beer. Overall, soaking after grilling means you get a juicier bratwurst. The best way to personalize your beer brats is to develop your very own beer mixture to cook them in. Sauerkraut is a popular topping on bratwurst, but you can also put some right into your beer mixture for a tangier flavor. Feel free to experiment! This is how you make your beer brats stand out from the rest of the sausages at the barbecue. Bring your beer to a boil and then let it simmer for awhile before adding the brats. Does the Beer You Choose to Use Matter? Some people think it’s best to use cheap beer. But the experts know that a good beer really can mean better brats in the end. I know it’s hard to pour out a pricey micr0-brew into a pot on the stove instead of into your mouth. But if you want a little extra flavor – why not go all out? Dark beers will give the bratwurst a richer taste. You may want to avoid IPAs as the hoppy bitterness tends to come out in the meat. Personally, I like to use something malty such as Leinenkugel’s Amber or Red. They’re a bit less expensive than other micro-brews (at least in our neck of the woods). Sometimes, when I don’t want to use up my good beer on the brats, I’ll just use one bottle of quality stuff and fill it up the rest of the way with a cheap domestic. Never pierce your bratwursts before you grill them. That just lets out all the juicy goodness. Mustard is a must. Stone ground is great, but try Dijon and other types too. Of course, plain old yellow mustard works fine if that’s all you’ve got in the fridge. You can put the onions from the beer mixture right on your brat. Diced raw onion and pickles or relish are also important toppings. Some of the most popular side-dishes for a beer brat feast include baked beans, potato salad, pasta salad, pickle spears, potato chips or french fries. You know – typical picnic stuff. Don’t even think about buying the pre-made beer brats! What are you some kind of amateur? 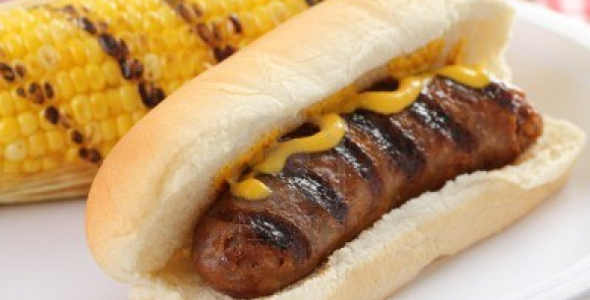 I’m sure there are plenty of other bratwurst grillers with their own strategy for the perfect beer brat. What did we forget? Let us know about your tips. There’s certainly more than one way to skin a cat – or a brat as the casing may be. For more bratwurst fun – check out the collection of hilarious and nostalgic Johnsonville Brat Commercials. Awesome tips from an expert in Sheboygan. Thanks for the comment Gigi! I dont think of buying the pre-maid beer brats as a bad/ametuer thing…. I look at it as just adding a little extra. I follow method #1 and stated in the article, par-boil then grill, using Johnsonvilles Beer Brats. As stated in the article, the type of beer used can and will make a difference. Everything that is ever made great happens because the time and quality stuff was put into it. Why use cheap beer or even cheap brats for that matter? Personally Im a Johnsonville guy myself, even though I live much closer to Klements town (Milwaukee). Also, like the writer, I like to use lienenkugles beers for my boiling, as that is the beer I prefer to drink. I’ve also used Miller Lite, which works well, but have to say Ive never tried anything else. Instead of experimenting, I prefer to just stick with what I know will turn out good! You wouldnt want to waste a good brat on an experiment would you?! For condements, I prefer to just leave them all off, with the exception of Kraut from time to time. The flavor of the brat and the beer/onion boil is more than enough for me. Ben – I guess I would agree with you. It’s cool to buy pre-infused beer brats if you still plan on cooking them in beer on your own. That’s actually a really interesting idea. Thanks for sharing! Always look forward to a good brat fry in the summer and for tailgating in the fall. All the recipes listed will provide optimum pleasure, however don’t underestimate your local butchers homemade brats. These small batch lovelies usually outclass the big boys. The Lake Country Piggly Wiggly’s are gold medal winners, I almost said wieners. You are absolutely right AJ! No one knows brats better than butchers right here in Wisconsin. Johnsonville’s are easy to find – but heading to a local place is even better. Thanks for stopping by and reminding us of that! Ex father in law made these while visiting in Millwaukee a few years ago . Excellent I say , I’m going to attempt tomarrow for my fant. 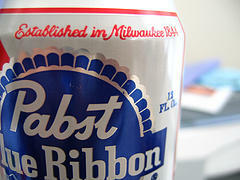 football party .Going to use PBR tough to find some variety here in SW pennsylvania. Kiebassa n kraut also planned. That sounds amazing, Tom. Thanks! Here at the Harley 110 anniversary.. The brats are excellent. They pretty much use your recipe (no brown sugar) as many people do. Miller high life is the beer of choice. Onions sauteed in BUTTER and BEER. A soft but, crusty roll is key.. BTW: $7.00 each. Worth it, especially after hitting the beer tents. H-D 110.. Loud and proud. Awesome. Beer brats and Harley Davidson! Is there a better Wisconsin combo? I think not. Sounds so good. I actually don’t use brown sugar myself either, but I’ve seen it mentioned in some recipes so I threw it in there as an option. Thanks for reading Steve. Have fun at the big Harley bash! I remember grilling brats in sub-zero temperatures and snow to my hind end in Sheboygan years ago at Christmas time. We used the method of grilling the brats first followed by simmering them in a pot of beer and onions. WOW. I still prepare brats that way today. I live in Idaho and usually have to depend on Johnsonville brats. Miss those day’s of Wisconsin brats. Back then they had brat day with parades and numerous grills that lined the parade route, which made seeing the parade a little hard to see once and a while. Those were the good old days. Brats just don’t taste the same without the Wisconsin atmosphere. My dad was born and raised in Sheboygan. I remember many a time as a kid we did the same thing as Lynn – frying brats in rain, snow or whatever as we could never get them “anywhere but Sheboygan”. They were fried using real charcoal not briquets and on many occasions, never made it to the beer. Just plop them on a buttered or plain semmel roll and be transported to heaven. After leaving home, I lived in almost every state in the union most thanks to my military career of 26+ years. I had to always come home to get a taste once or twice a year. When I graduated from college in Pocatello, ID, my dad had to bring the brats as part of my graduation dinner. Most areas of the country had no idea what a brat was. Today Johnsonville brats are very easy to find; I can fry them up and simmer in beer and onions. What a treat and fond memories. Thanks for sharing your story, Barb! Amazing how much food can be a reminder of home and family, isn’t it? Sam Adams would probably give the bratwurst some great flavor. Thanks for the tip Mike! I think sometimes we forget that grilling isn’t the only way to go. Baked brats are a great wintertime meal when your grill is buried in snow. Mike, I just came across this now and 100% agree with Sam Adams. For years I’ve been using Sam Adams Cherry Wheat (fruit beer gives meat a great flavor), with a mixture of onion, celery salt, fresh ground black pepper (pre ground doesn’t really do anything in the beer), garlic powder (fresh garlic roasted for just a few minutes works best), and the secret ingredient: Italian seasoning. They sit in the beer marinating for about a day before I throw them on the grill. I also (you’re gonna hate me) poke 4 holes with a fork right into the center of each brat while they marinate. The beer soaks all the way to the core, and there’s never a loss of juice. It’s just important to make small shallow holes. We like them a little crispy so I cook it all the way, which is fine, because the beer always leaves them super juicy. Finally, IF there are leftover brats, I put them in a ziploc bag with about a half cup of the beer mixture and make sure to get all the air out of the bag. It’s basically marinating again until we reheat them. Nobody likes a microwaved brat, but when it’s been sitting in beer, it’s not an issue, and they come out just like they came off the grill. I’m from Pennsylvania and they way we do it (my family) is boil the brats in dark German beer and homemade kraut (sometimes I boil it in Polish kraut), while adding worcestershire sauce. Then I brown the buns in the grill by adding some butter or EVOO. Then add some raw kraut and your favorite mustard. Don’t ever use ketchup. Good way to get your brat taken away. I won’t cook for you if you use ketchup on brats. It made me a hit when I brought them to my unit’s picnic. My recipe has never disappointed. I use a sauce pan and lightly and slowly warm the beer and onion getting it to a simmer, never letting it boil. I will usually throw in a couple chili peppers for an added kick but thats optional. I pan fry or grill the brats, getting a nice brown on them and then throw them in the beer. Using the pan I fry the brats in I sautee onion, bell pepper, mushroom, and garlic and deglaze the pan with beer as well. Amber ales work very well! I grew up in Sheboygan Falls, where my granddad was a butcher. He taught my dad & my hubby the right way to “fry out” brats. They were soaked in plain water til they went on the grill. Had to use Cedar Grove Charcoal! Then they’d be turned by using the fingers – no tongs – until they were done to the right touch. We’d have the Sheboygan Semel (hard roll) ready & the brat went right in off the grill. Nothing tasted better! On Sunday summer afternoons we’d take rides around the area, stopping at the brat stands that were in so many little towns. I tried your recipe for the first time last month for a graduation party, after my daughter’s suggestion. Funny how as we get older we sometimes stick with the same old (boring) way of cooking. I simmered the beer (I used Capital Wisconsin Amber) with the onions and the rest of the ingredients listed in your recipe (including the brown sugar), browned the brats on the grill and then added them to the beer mixture to finish cooking. I refrigerated overnight and the next day heated in a crockpot on low for the party. YUM! Rave reviews. I’ll never cook another brat the same old way again! Awesome! Glad to hear it, Judy. Thanks so much for letting us know! Judy did you marinate the brats in anything over night? Also when you reheated them in the crockpot did you use water or beer? How long do you simmer after the grill, to make sure they’re cooked all the way thru? I pre boil mine in beer and onions for about 5 minutes. Than I throw them on the grill and that’s that. I’ve gone as far as to take one of those Turkey injectors and injected my beer of choice into the ends of the brat’s before boiling them in beer. Doesn’t take much but they are juicier on the grill. Okay dokey. This is coming from a Floridian who never got the whole beer brat thing. Everyone I know around here always soaked them in the beer first. Some simmer the beer first, some just dump the brats in cold beer and let them soak for a few hours. The brats were okay, but not anything astounding. I couldn’t figure out what all the fuss was about. I made crock pot sauerkraut last week for another meal, and had a bunch of left overs, so decided to buy brats. My husband loves them, but I’d only made them twice. So yesterday I stumbled upon this blog while researching the best way to make them. I had to unlearn everything I learned! I grilled them first, then put them in the beer broth of beer, butter, and onions. I’d never heard of putting butter in the beer either! It smelled so good, I wanted to drink it while it was simmering. I have to say hands down, these were the best brats I’ve ever tasted! I might have been born a Michigander and raised a Floridian, but when it comes to bratwurst, I’m a converted Wisconsinite. Just made these. Used Spaten Oktoberfest. Grilled then simmered with onions, Worcestershire, and garlic salt. Ate on a bun with sauerkraut and Düsseldorf mustard. Excellent! Thanks! Simmer in Foster’s premium ale with onions, Finish brats on grill while boiling off the ale to brown the onions. Serve on buttered buns with mustard. Nope, no soggy, beer soaked brats for me. I wouldn’t soak any other piece of meat in beer and I damn sure wouldn’t do it to a brat. All the fat in the brat makes them as juicy and tasty as they can be…unless you are a poor grill master and make them burst before they are done.